How Does Binge-Watching TV Affect Viewers – and Storytelling? I’m in the midst of binge-watching The Wire, an HBO show that I missed the first time around. There were 60 episodes across five seasons, spread over almost six years. I’ll cover it in six weeks I figure. That’s slow. Netflix says most viewers now finish a season of a show within three days. Even that can be accelerated with binge-racing, which Netflix says is the practice of watching an entire season within a day of a show’s launch date. Canada has the highest percentage of 24-hour finishers. That still isn’t fast enough for some people. There’s also speed-watching, where you view a show at 1.5X the normal rate. So an hour-long show only takes 40 minutes. Hulu reports that last year 11,000 of their subscribers caught up on all 15 seasons of CSI (335 episodes in an average of two months). And 35,000 subscribers watched all 10 seasons of Futurama in an average of just 18 days. 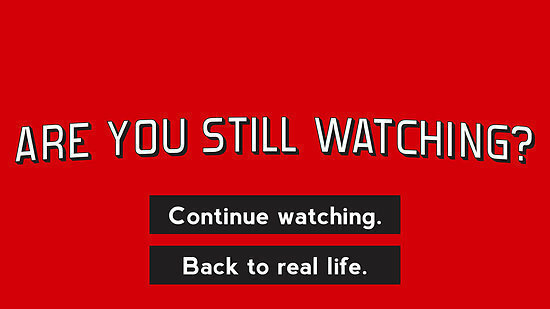 Before streaming and on-demand services, shows were meant to be consumed once a week, with four months or more between the end of one season and the start of the next. By recording, people could of course save a bunch of shows and watch them all in a row. Or binge when a box set of a season came out. That’s different from binging being a default viewing preference. Two questions. Have viewers’ habits influenced the very way shows are crafted? And what does the act of binge-watching do to the viewer? With the ability to binge, we may yearn for a different type of storytelling. Writing in The Hollywood Reporter, columnist Marc Bernardin noted that writing for TV is a war for retention. “How do you keep an audience’s attention from commercial break to commercial break, from episode to episode, from season to season?” he says. Bernardin argues that shows used to be about the cliffhangers that keep viewers coming back. With streaming and on-demand services, he says that TV production is now about how to break down a 10-hour movie. Streaming shows can demand more of viewers. A piece on Den of Geek suggested that, with series consumed over fewer sittings, there’s not the same need for call-backs and other techniques to remind viewers what came before. TV writers and producers can create more layered narratives, with greater nuance and complexity. Shows built for streaming often offer more shifts of pacing and more time spent on mood. If a season is like a novel, then each episode is a chapter. That’s what a piece in Vox stated. It said that binge-watching alters the basic unit of cinematic storytelling. We’ve gone from telling a story in a single episode (30 or 60 minutes) or a film (90-180 minutes) to a season of indeterminate length. Episodes aren’t really stand-alone units. The end of one is useful to prompt us to eat, sleep or tend to our lives, but it’s only that, said Vox – a chapter stop amidst a longform arc. While binge-watching might seem like the height of impatience, the opposite may be true. An article from the Cleveland Clinic stated that one reason we like to binge-watch is that we get a shot of dopamine from the pleasure. It gives our brains “a feel-good high”. Binging keeps that chemical streaming. You don’t have to wait seven days for the next episode. More like seven seconds. That’s not necessarily a bad thing. Is there any difference between binging five episodes of a show and staying up late to finish the novel you just can’t put down? In both cases, we’re absorbed in a story and want to see how it ends. What’s wrong with that? The downside? When the binge cycle ends, we can feel down. Cleveland Clinic said binging can become a problem when it’s used almost medicinally. One British survey found that 30% of people have skipped 2.5 or more hours of sleep because of binge-watching TV. One-third also said they’ve had mental health issues after finishing a series, including depression, anxiety and loneliness. How might binging affect our enjoyment and recollection of a show? A study from the University of Melbourne split students into three groups. Each watched the same series, which consisted of six one-hour episodes. One group watched an episode a week. Another watched an episode a day. The third watched the entire series in one shot. Twenty-four hours after each group finished, they were quizzed on details of the show. Additional quizzes were given a week later and then again in five months. The binge-watchers showed the best memory the day after, but the worst five months later. Weekly viewers demonstrated the best retention of what the series was all about. Daily viewers, meanwhile, enjoyed the show the most. The bingers showed significantly less satisfaction. That’s the flip side of the feel-good theory. Binge-watching can bring pleasure, but compared to what? Does drawing out a viewing experience over weeks, months or years take us on an even more rewarding journey? We’re figuring that out. Sometimes, binge-watching feels like the equivalent of grabbing potato chips out of a bottomless bag. Don’t knock it. It tastes good and releases pleasure chemicals too, even if you can feel blah after. Still, at the outset you’re filling a hunger, a craving for those chips. There’s a reason why the Canadian on-demand service that airs HBO, The Movie Network, Showtime and more is called Crave. Which is where I’m watching The Wire now. Forty-two episodes down, 18 to go. As great as the show is, I wonder if I’ll have the same relationship with it as someone who savoured and longed for it over six years.